The Asus Strix R9 Fury is a finely crafted piece of gaming hardware, provided your case is roomy enough to house it. (+) Furies: High performance; good cooling; more efficient than stock Fury; less expensive than Fury X. (-) Furries: Still expensive; requires lots of space; less efficient than GTX 980; drivers could use tuning. It’s not a stretch to say that the launch of AMD’s Fury X was a disappointment on many levels. 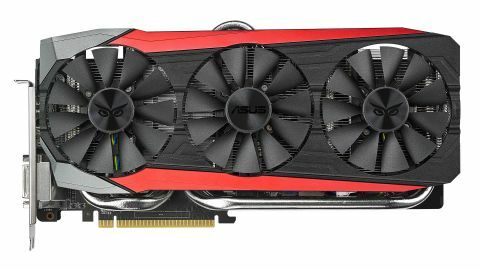 Initially billed as the fastest of all current GPUs, by the time the Fury X actually launched, driver updates and Nvidia’s GTX 980 Ti were enough to spoil the party. And let’s also be clear on that “launch” business: even one month after the initial release, it’s difficult/impossible to find any Radeon Fury X cards in stock—and if you do happen to find one, don’t be surprised if it’s currently priced well above MSRP. Some of the delay could potentially be blamed on AMD “reworking” the liquid cooling solution to minimize pump noise, but that shouldn’t affect the vanilla Fury that was officially announced last week…except AMD didn’t provide any hardware samples, leaving it up to the manufacturers of Fury cards (currently Sapphire and Asus) to provide samples. Looking back from our lofty hindsight perch, it appears the Fury line launched before there was sufficient supply. Couple that with apparent production problems and drivers that still appear to need a bit of tuning, and you have to wonder why AMD didn’t just wait another month or two. Oh, that’s right: Windows 10. It’s not clear how many people are planning to buy a new system for Windows 10. Technically, if you have a PC that’s running Windows 7 or 8.1 without performance issues, it should handle Windows 10 just fine. Anyway, maybe AMD wanted to get Fury out the door before the new Windows 10 PCs launched, even if that meant launching with a rather limited supply. Or perhaps the cards are just so popular that no one can manage to keep them in stock? After all, even if it’s not the absolute fastest GPU, Fury X is still very powerful, and there are many gamers who still play for Team Red. Unfortunately for AMD, competitor Nvidia doesn’t appear to have any issues with supply of their 980 Ti, which has been readily available since launch (though it did sell out the first week). It doesn’t help that the 980 Ti also overclocks better and uses slightly less power than the Fury X. But the vanilla Fury that we’re looking at today is a different story (assuming inventory can keep up with demand once the cards hit retail). In some areas, the Fury is an exact match for the Fury X: they both have 4GB HBM (High Bandwidth Memory) offering 512GB/s of bandwidth, they both have 275W TDP, and they both have 64 ROPs. That last item in particular seems like it might be holding back Fury X performance—not that AMD really had any room to add additional ROPs, as the 8.9 billion transistors coupled with the silicon interposer for HBM mean the Fiji GPU is effectively as big as it can be, but we do have to wonder what Fury could have done with 96 ROPs. The main difference between the two GPUs is the number of compute units (CUs). Fury X has the full 64 CUs, giving it 256 texture units and 4,096 shaders; Fury, by comparison, has 56 CUs, with 224 texture units and 3,584 shaders. It also has a core clock 50MHz lower, though that shouldn’t prove too big a deficit. On paper then, Fury X offers the same amount of bandwidth, and 14 percent more compute resources. Combined with its clock speed advantage, Fury X should be up to 20 percent faster than the vanilla Fury, but in cases where the GPUs are limited by the ROPs and/or bandwidth, we may see a performance gap of five percent or less. The Asus Strix R9 Fury further muddies the waters with its design and specifications. It has the same clock speeds and other features as the reference R9 Fury, but Asus has chosen to limit the GPU (ASIC) power by default to 216W, though you can boost this via the Asus GPU Tweak utility. This doesn’t appear to affect stock performance, but certain stress-testing applications, e.g., Furmark, will clock down a bit. Peak power use, on the other hand, is lower than the Fury X and 980 Ti, and the card runs quietly and doesn’t get too hot, both admirable qualities. As far as clock speeds, by default the Strix is clocked at the usual 1,000MHz of Fury, but Asus does provide a 1,020MHz OC option via GPU Tweak—which also bumps up the power limit by 10 percent. The OC is so small, however, that it’s more of a check-box item than a serious factory overclock. Standard R9 290X shown on top of theStrix R9 Fury for size comparison. The Asus Strix Fury is definitely made for windowed cases, with an eye-catching aesthetic and a pulsating Strix logo. However, the triple-fan cooler makes it substantially larger than the Fury X, albeit without a CLC taking up additional space. Those with larger cases won’t have any trouble installing the Strix Fury, 390X, or any other large GPU; mATX and smaller form factors are a different matter. The card is a full 12-inches in length, plus the fan shroud is taller than a “normal” graphics card, so you’ll definitely want to ensure your case is large enough before purchasing—or just buy a fat new case to house your GPU(s). Besides the large custom cooler, Asus has a reinforced frame and metal backplate that makes for a sturdier graphics card, and they’ve also used a 12-phase power delivery mechanism with “Super Allow Power II” capacitors, chokes, and MOS. The result of these high-end features is that the Strix Fury also carries a higher MSRP of $579, though we’ll have to see where street prices land over the coming weeks. All of the latest GPUs have been tested with the latest publicly available drivers, AMD Catalyst 15.7 or Nvidia 353.30. The AMD 15.7 drivers are effectively identical to the 15.15 launch drivers for the Fury and 300 series, as well as the 15.6 beta drivers previously used on the 200 series and earlier GPUs, but all AMD GPUs are now using the same drivers. Note also that we are now reporting 97 percentile minimum frame rates, as discussed previously. Fury X had a difficult time with 980 Ti, ultimately failing to lay claim to the super heavyweight title. Dropping down a weight class to the mere heavyweights changes the story. Here, the $549 R9 Fury takes a clear lead over the $499 GTX 980, though there are still cases where Nvidia leads. The R9 Fury has significant leads in Batman: Arkham Origins, Hitman: Absolution, and Shadow of Mordor; meanwhile, GTX 980 leads in Metro: Last Light, as well as claiming quite a few victories at 1080p. Overall, the two GPUs are in a dead heat at 1080p, but the Fury leads by eight percent at 1440p and a convincing 13 percent at 4K. And this time there’s no caveat about 6GB vs. 4GB VRAM. Considering the pricing, however, it’s not too much of a stretch to point to the GTX 980 Ti as an even faster GPU. It might cost $100 more than the baseline Fury cards, but it’s only $70 more than the Asus Strix Fury. What’s more, that 12 percent increase in GPU cost will deliver on average 11 percent more performance at 4K, 15 percent more at 1440p, and 20 percent better frame rates at 1080p. And that’s before overclocking. In that sense, the story is similar to the earlier Fury X. Speaking of which, the more expensive AMD GPU only ends up outperforming the air cooled Fury by 6–8 percent on average. Looking at just the minimum frame rates, the lead tends to be quite a bit less. On average, the 980 actually delivers equal or better minimum frame rates to the Fury, which again suggests that further tuning for the Fury drivers would prove beneficial. Unigine Heaven in particular has issues with AMD GPUs right now, but since that’s more of a graphics test than an actual game, we place less stock in those results. Removing Heaven from the averages, we find that the Fury and 980 are essentially tied for minimum FPS. Another month hasn’t radically altered the performance ladder in the GPU world, but now AMD has filled the gap between the R9 390X and the R9 Fury X. What’s more, the Asus Strix Fury fills that gap while using substantially less power as an added bonus. The 390X still packs a lot of performance, but peak power use is over 120W higher than the GTX 980, and performance is still lower on average. The Strix Fury dances to a different beat and manages to surpass the GTX 980 while only using 50W more power under load, and slightly less power than the 980 Ti and Titan X. It’s not a better fighter in every discipline, but it packs a punch and helps keep the pressure on Nvidia. There are still shortcomings with AMD’s Fury line, unfortunately. One area we still haven’t been able to fully explore is overclocking. The Asus Strix Fury managed to run at 1,070MHz core (seven percent overclock) and 1,080MHz HBM (eight percent overclock), but without the ability to tweak voltages, that’s all we can get from most Fiji-based cards right now. Once the utilities are updated, we might be able to improve the situation… or additional voltage may not even help. Nvidia’s Maxwell 2.0 GPUs meanwhile continue to deliver substantial overclocks (20 percent or more over stock clocks) and better power efficiency. For those backing the green corner, we haven’t seen anything that would convince them to change sides, but short of the second coming that’s almost a given. Those rooting for Team Red, on the other hand, can now point to improved performance and near-parity, which is a welcome change. The fence sitters still need to decide how much they’re willing to spend—or if they even need to spend anything at all. The improved performance from GM200 and Fiji can be substantial, but so is the price, and it’s entirely possible to have a great time gaming on a PC even with lesser hardware. And even 1080p at high quality is generally a superior graphical experience than you’ll get from console gaming. But if you’re looking to run 4K resolutions at maximum quality, most single GPUs will still struggle. Looking forward to next year, the real change is going to be TSMC’s 16nm FinFET process, not to mention both AMD and Nvidia will be looking at HBM 2.0, which will double the bandwidth and memory capacity of HBM 1.0. After four years, GPUs will finally move on from 28nm, and the combination of 16nm FinFET and HBM 2.0 as the potential to make even today’s best GPUs look rather tame. Windows 10 is launching as well, and by next year we should also have a better idea of what DirectX 12 really means for gaming. In the meantime, the AMD R9 Fury basically delivers linear price/performance scaling over the GTX 980, which is quite good at the top of the performance ladder. It can handle just about anything you might want to throw at it, up to and including 4K gaming (though generally not at maximum quality). The Fury ends up being nearly as fast as the Fury X for $100 less, making it a slightly better value proposition, and there’s still hope that driver improvements can further increase performance. Asus, for their part, offers a potent card in the Strix R9 Fury, for those with the budget and a sufficiently large case. It runs quietly and stays cool even under pressure, and Asus has really put a lot of engineering prowess into the design, allowing them to reduce power requirements by about 30W compared to other Fury designs. Is that enough to warrant the $30 price premium over other R9 Fury cards? For some users, certainly, but whatever Fury card you choose will still offer a healthy amount of performance.